News by Lindsay M., Matt S., and Trent P.
Welcome to Digitally Downloaded’s regular catch-up news feature! With each issue we will bring you the best news that you may have missed. Grab the biggest mug you’ve got, fill it with your favourite brew, and catch up with us (and our favourite news anchor, Dee Dee)! I am so incredibly excited about this news, if that wasn’t obvious. Sekai Project has been my number one source for Japanese visual novels (and other titles) on PC for years now, and the company has now announced it has formed a new initiative — called Sekai Games — to focus on the console market exclusively. The press release for Sekai Games states the focus is to “deliver a wide variety of video game genres to the worldwide market to all major console marketplaces,” including visual novels and in-house IPs. The first game under Sekai Games has already been released: A Magical High School Girl is available on the Switch now. Up next will be fault (above), coming this November for PlayStation 4 and Switch. It tells the story of a princess and her Royal Guard as they escape from an assault on their homeland; but they end up mysteriously teleported into an unknown forest. 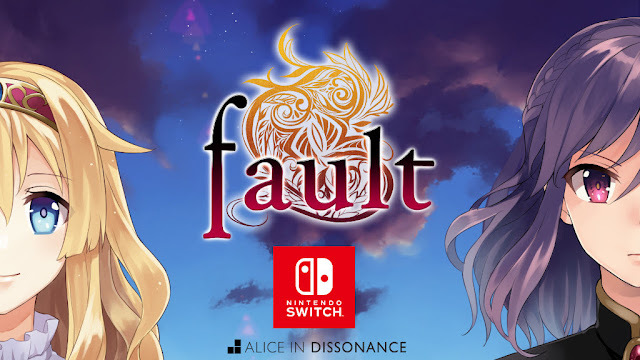 The fault series is widely believed to be one of the greatest contemporary visual novels due to a cast of strong female characters. Following that, in about a year, M.A.S.S. Builder will be coming to the Switch and PC. It’s an action game full of customisation and strategy. M.A.S.S. stands for Mechanical Assault Skeleton Suit, which you take to the battlefield. It is the first game from Thai developer Vermillion Digital. We’ve got a release date for Warriors Orochi 4, which promises to be the next “big” game for Koei Tecmo musou fans! It releases in Japan on September 27 of this year. This is ahead of the western release, but that is still on track for 2018 as well. We’ve also got some more details of the game, and for some reason Zeus shows up as a playable character for the first time in a Warriors title. No, we don’t understand why he’s there, either, especially since the roster otherwise pulls back on the number of characters from outside of the core Samurai Warriors and Dynasty Warriors franchises. Anyhow, the game does look really good. You’ll be able to play it on PlayStation 4, Xbox One, Nintendo Switch, and PC. In the lead up to E3 this week, Sony has published a handful of reveals for games prior to its conference. One not to miss is the announcement of Twin Mirror. Published by Bandai Namco, Twin Mirror is an upcoming title from Dontnod Entertainment, the developer known for Vampyr and Life is Strange — two games which feature heavy story mechanics. Twin Mirror is no different, with the story-driven adventure game featuring a journey that explores the elements of choice and hypocrisy focusing on investigative elements. Players will be able to experience the game on Xbox One, PlayStation 4, and PC in 2019. Set in the fictional town of Basswood, West Virginia, the game focuses around the protagonist Sam. Sam has experienced a heavy breakup and has returned to the town to attend the funeral of his best friend. Things take a turn for the worse when Sam wakes up in his hotel room with a shirt covered in blood and no memory of the previous night. This sets up the plot that is full of mystery as the players goal is set to recall memories with choices and relationships determining Sam’s fate. The team that brought Voez and Deemo to Nintendo Switch is also bringing Lanota to the console. This one will released on June 14 in North America and Japan (so, this week, when you need a break from all the E3 excitement), and June 20 in Europe, Australia, and New Zealand. It’ll set you back about $15 depending on your currency (which is a bit more than the $3 it costs on mobile, but the Switch is a better device for gaming, right), and just like Deemo and Voez, this one is actually quite a gorgeous, artful little rhythm game. Unlike most rhythm games, Lanota actually has a strong sense of narrative. This game will feature over 70 music tracks (including a few that are exclusive to Switch), with four difficulty settings. That sounds huge to us. The Switch’s strength as a rhythm game hub continues.